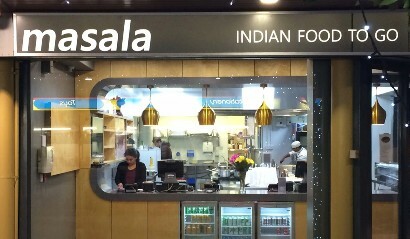 The new Masala Indian Food To Go at Killiney Shopping Centre is a fine example of this genre and has quickly become a favorite in our house. ‘Masala’ is the Hindi name of the Indian spices and this fab eatery specializing in top level Indian food ‘to go’, fulfills its promises to use those spices in just the right amounts, in just the right places. With a large open kitchen allowing you to watch the chefs as they weave their magic, the menu is a litany of all my favourite regional Indian dishes such as South Indian mango prawn with coconut & mango based curry flavoured with spices and herbs and served with pulao rice; Keralan fish curry with a twist of lemon juice and cilantro; as well as Baruchi lamb, slow-braised with black pepper and coconut, tempered with mustard seeds. For my most recent order, I started with the aloo bonda, a lightly spiced mashed potato cake cooked in gram flour & herbs and served with tamarind dips, whilst Brendan went for their kochi pork fry batter-fried strips of pork fillets tossed with sweet chilli & a smoked coriander sauce which he absolutely loved. Also amongst the starters, you should definitely consider trying their Nawabi seekh kebab, which I’ve had before and is simply delicious. For the mains, there is a fabulous selection to choose from whether you’re a carnivore or a veggivore, but, on this occasion, I went for their Murgh Methi, free range boneless chicken breast cooked in a creamy spinach & fenugreek flavour sauce served with pulao rice, and I was suitably impressed with my meal. Himself, on the other hand, decided to try a Goan black tiger prawn curry which he found delicious cooked in coastal spices and finished with coconut milk & vinegar. Plus plus, they also have great Nutrition Diet and Vegetarian sections with dishes like Masala asparagus pan-fried with roasted cumin, onion and shredded coconut or saag paneer, homemade cottage cheese cooked with fresh spinach and fenugreek, and finished with fennel and lime. On a previous occasion we were absolutely wowed with a dish of pan fried asparagus, roasted cumin, onion and shredded coconut and bowled over by an aromatic protein rich spicy curry sporting soya bean nuggets and green peas which was just the best. It’s a winner. Oh, and check out their party service.